Achieving innovation alignment always needs clear framing. 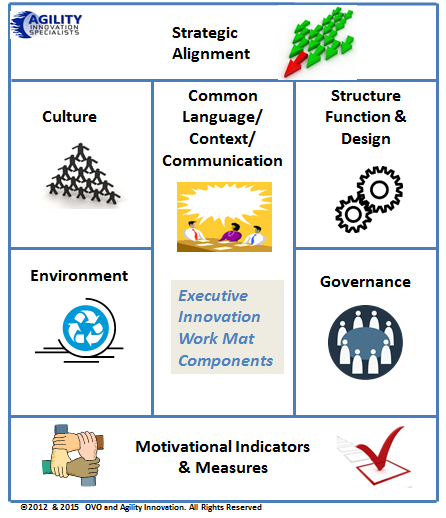 I would argue most problems or disappointment with our innovation efforts can be attributed to a lack of alignment to the organizations strategy and/or its poor governance with our end results. Here I am suggesting a way to overcome this constant frustration. The intent with developing this work mat approach has been to clearly set out that much-needed ‘greater’ strategic connection through engagement at a senior level, they drive the outcomes, they provide understanding beyond the vision to make the neccesary connections, they fuel the engine and ignite the energy that innovation needs.